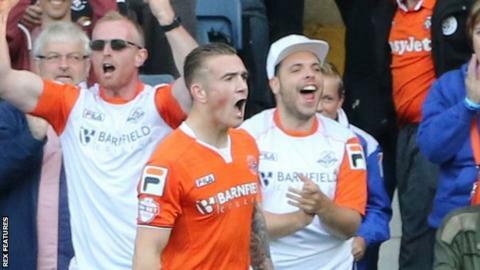 Substitute striker Jack Marriott scored twice for Luton as they cruised to a win at Hartlepool. Marriott replaced injured Craig Mackail-Smith in the first half as Jonathan Smith put Luton ahead after Luke Guttridge's effort was saved. Rakish Bingham wasted two good chances for the hosts before Billy Paynter's diving header levelled it up. Marriot scored twice in four minutes to extend the Hatters lead and Ollie Lee curled in from 25 yards in injury-time. "It's been a long week, a fair few miles, but a fantastic week. "If somebody had said take six points and score seven goals, you'd have snapped their hands off. "Jack's come on and taken his opportunity, we're absolutely delighted for him." Match ends, Hartlepool United 1, Luton Town 4. Second Half ends, Hartlepool United 1, Luton Town 4. Scott Harrison (Hartlepool United) is shown the yellow card. Goal! Hartlepool United 1, Luton Town 4. Olly Lee (Luton Town) right footed shot from outside the box to the top right corner. Attempt missed. Scott Harrison (Hartlepool United) right footed shot from outside the box is high and wide to the right. Jake Carroll (Hartlepool United) wins a free kick on the right wing. Corner, Luton Town. Conceded by Andrew Boyce. Attempt missed. Nicky Featherstone (Hartlepool United) right footed shot from the right side of the box is close, but misses to the right. Attempt missed. Luke Guttridge (Luton Town) right footed shot from outside the box is close, but misses to the left. Substitution, Hartlepool United. Nicky Featherstone replaces Michael Woods. Substitution, Luton Town. Nathan Doyle replaces Josh McQuoid. Corner, Hartlepool United. Conceded by Mark Tyler. Attempt saved. Rakish Bingham (Hartlepool United) right footed shot from the right side of the box is saved in the bottom right corner. Attempt missed. Michael Woods (Hartlepool United) right footed shot from outside the box is high and wide to the right. Substitution, Hartlepool United. Scott Fenwick replaces Billy Paynter. Corner, Hartlepool United. Conceded by Scott Griffiths. Attempt saved. Rakish Bingham (Hartlepool United) left footed shot from the centre of the box is saved in the top left corner. Olly Lee (Luton Town) wins a free kick on the right wing. Corner, Hartlepool United. Conceded by Steve McNulty. Goal! Hartlepool United 1, Luton Town 3. Jack Marriott (Luton Town) right footed shot from very close range to the centre of the goal. Assisted by Luke Guttridge. Attempt missed. Billy Paynter (Hartlepool United) header from the centre of the box is just a bit too high. Attempt missed. Andrew Boyce (Hartlepool United) header from the right side of the six yard box is close, but misses to the right following a corner. Attempt saved. Rakish Bingham (Hartlepool United) left footed shot from the left side of the box is saved in the bottom left corner. Goal! Hartlepool United 1, Luton Town 2. Jack Marriott (Luton Town) right footed shot from the centre of the box to the centre of the goal. Assisted by Cameron McGeehan. Attempt saved. Billy Paynter (Hartlepool United) right footed shot from outside the box is saved in the centre of the goal. Foul by Steve McNulty (Luton Town). Rakish Bingham (Hartlepool United) wins a free kick in the defensive half. Second Half begins Hartlepool United 1, Luton Town 1. First Half ends, Hartlepool United 1, Luton Town 1. Andrew Boyce (Hartlepool United) wins a free kick on the right wing. Goal! Hartlepool United 1, Luton Town 1. Billy Paynter (Hartlepool United) header from the centre of the box to the bottom right corner. Assisted by Rhys Oates. Foul by Scott Griffiths (Luton Town). Brad Halliday (Hartlepool United) wins a free kick on the left wing.